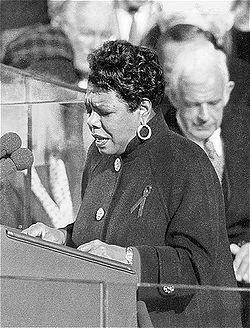 In addition to her six volumes of autobiography, Maya Angelou has written several volumes of poetry, including On the Pulse of the Morning for the inauguration of President Clinton. She has a life-time appointment as Reynolds Professor of American Studies at Wake Forest University. The following is a personality profile of Maya Angelou based on her work. Maya Angelou is social, unpretentious and can be perceived as compulsive. She is intermittent, she has a hard time sticking with difficult tasks for a long period of time. She is laid-back as well: she appreciates a relaxed pace in life. But, Maya Angelou is also empathetic: she feels what others feel and is compassionate towards them. Considers helping others to guide a large part of what she does: she thinks it is important to take care of the people around her. She is also relatively unconcerned with tradition: she cares more about making her own path than following what others have done.